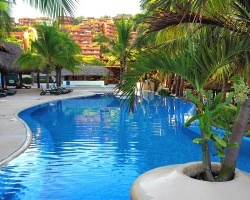 *Pacifica Senior and Master Sands* is a hillside resort along the edge of Palmer Bay in Ixtapa. 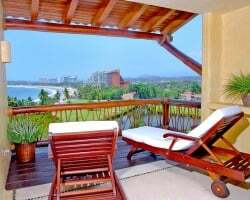 Each richly appointed 1 or 2 bedroom suite features a private swimming pool or Jacuzzi, fully equipped kitchen, and room service. For guests looking for a quiet and relaxing vacation, or for some fun in the sun, there are plenty of amenities to suit every visitor's needs at this luxury resort. Indulge in a full service massage, or play a game on the 18-hole golf course. Take a dip in one of the 6 on-site swimming pools, or go on a surfing or snorkeling adventure from the resort's beach. For more information about Pacifica Senior and Master Sands, visit www.pacifica.com.mx. Come to this tropical paradise resort each year! Floating week! Buyer may receive a title fee credit, inquire for details! Annual floating week! Multiple pools, private beach and a golf course! Buyer May Receive A Title Fee Credit, Inquire For Details! Explore all the culture & endless entertainment in Mexico every year! Buyer May Receive A Title Fee Credit, Inquire For Details! Explore Mexico each year during any week you choose! RTU until 2034! Buyer May Receive A Title Fee Credit, Inquire For Details! Floating gold season week! RTU until 2035! Buyer may receive a title fee credit, inquire for details! RTU until 2035! Stunning hillside resort! Floating, except weeks 5, 26-34, 50-53, Easter and after Easter. Buyer May Receive A Title Fee Credit, Inquire For Details! 19,100 Pacifica Credits left on contract! RTU until 2026! Buyer may receive a title fee credit, inquire for details! Annual week 8 usage! RTU until 2025! Buyer may receive a title fee credit, inquire for details! Price is negotiable. Hill top resort with incredible views year round! RTU until 2029! Buyer will receive confirmed reservation for 3/13/18-3/24/18! Escape to your tropical paradise each year in the week of your choice! Buyer may receive a title fee credit, inquire for details! Retreat to this tropical paradise! Choose your week in gold season! Buyer may receive a title fee credit, inquire for details! Pick your vacation dates with an annual floating week! RTU until 2045! Buyer may receive a title fee credit, inquire for details!! 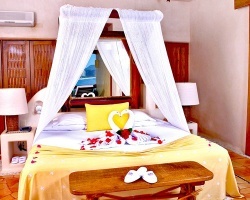 Stunning oceanfront suite! Annual floating week! RTU in perpetuity! Buyer may receive a title fee credit, inquire for details! SPECIAL FINAL OFFER! Enjoy resort during any gold season week or exchange w/ RCI! RTU 2035! Price Negotiable & Buyer may receive a title fee credit!